For applying a uniform, secure band to a wide variety of products, from delicate wedding invitations to die cut labels, mail, currency, posters, business cards and brochures. Ovalstrapping's OB/OP-301 - Gently but firmly applies white or brown kraft paper, or clear polyfilm banding to packages as small as 1.2" wide or as large as 15" wide at up to 24 straps per minute. Easily secure bands to a wide variety of products, from delicate wedding invitations to die cut labels, mail, currency, posters, business cards and brochures. Adjustable tension control allows you to match banding tension with the product; firm for solid products, gentle for delicate products. 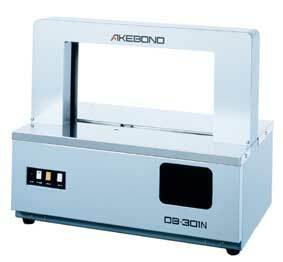 Provides a low-cost method of banding small to medium size packages. 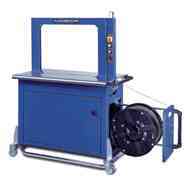 Simple to operate, fast start-up, and quick threading. Send mail to webmaster@novatechpackaging.com with questions or comments about this web site. 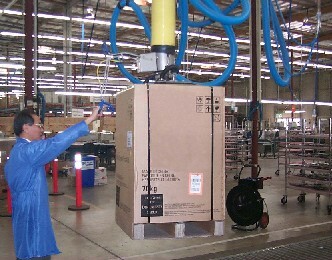 Copyright © 2002-2007 Novatech Packaging Systems, Inc.